Dubai, UAE, September 09, 2018: With the summer nearly over, people in the UAE and across the region are back to their routine with a huge focus on health, fitness and fashion. With health bands becoming a trendy necessity, look no further than Huawei’s TalkBand B5 that is set to become your essential accessory adding to your personal style statement. It promises better visual performance with a larger touch screen display of 1.13-inch. The Huawei TalkBand B5 is a 2-in-1 hybrid device that functions as a smart Bluetooth headset and smart health tracker. While big screens have already become an obvious trend with mainstream tech devices such as mobiles, TVs and computers, most smart wearable devices continue to have smaller display screens. Based on Huawei’s customer centric approach and its constant research to be on top of market needs, it’s latest Huawei TalkBand 5 offers an innovative visual experience with a larger screen display unlike most wrist bands in the market. With a 1.13' HD color display, its bigger screen and HD resolution, Huawei TalkBand B5 offers refined visual and vivid colors, while it also allows more display content, so users can read a whole chat message at one glance. Offering a clear and deleicate look, the new Huawei TalkBand B5 features a full arc 2.5D glass panel. It is easy to clean and dirt resistant, thanks to its special anti-fingerprint coating on the screen. With a gentle wipe the screen is as good as brand new without any smudges. Its stunning minimalistic uni-body design offers classy and simplistic aesthetics that would be of appeal to the business fraternity. The metal backing bracket adopts Swiss watch making techniques for remarkable details and quality. The wristband is simplistic, streamlined yet stylish, presenting itself as the must have wrist accessory this season. 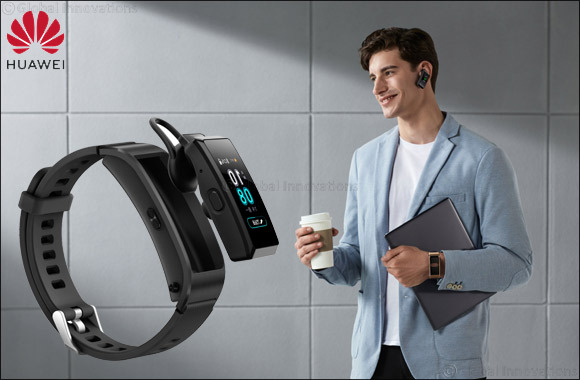 If you are looking to arm yourself for a business meeting or for daily life routine, look no forther than Huawei TalkBand B5 as it comes with two different straps that are set to suit a variety of occasions and styles allowing users to mix and match as per their preferences. For instance, the Mocha Brown straps might suit for business occasions as its classy and elegant design can be perfect for formal meetings, seminars or conferences. The leather strap is made with full grain cowhide Italian leather beautifully crafted to achieve the best natural breathable quality. Whether you are toasting or giving a speech, your confidence is sure to be boosted with this classic style. Whether you are an ardent gym goer or merely sportive by nature, the Huawei TalkBand B5’s light and breathable straps will make you comfortable in sweaty and sticky conditions. This Sports version with the black silicon strap is made of high-quality soft silicone with breathable concave structure that fits perfectly at the back of the wrist. It’s uber trendy perforated design helps sweat to evaporate during running or gym sessions keeping the wristband secure on the wrist. The stylish patterns at the front create a sleek and modern look. This probably is the one feature that sets the innovative Huawei TalkBand B5 apart from its competitors. The 2-in-1 design of wristband and Bluetooth headset are optimized for a better performance. Whether you want to answer or make a call, all you need to do is press the button to release the device, and it transforms into your Bluetooth headset right away. When you finish a call, gently push the headset back on the bracket, and voila, it’s back to being your trendy arm candy. This convenient and easy-to-use device offers impressive and dynamic appearance while being a comfortable wearable piece. Thanks to this new device, its users will be able to monitor their health day and night, and be certain not to have missed a call even when in meetings, exercising or catching a flight. The wearable comes with stylish and premium straps offered in sport and business editions. The HUAWEI TalkBand B5 is water and dust resistant so it works in rain and snow conditions, as well as being sweat resistant and functioning whilst washing hands. It is also powered by HUAWEI TruSeen™ heart rate technology that monitors the heart rate 24/7 and while running, treadmill running, walking and riding. So rush to your nearest select Huawei retailer or to its flagship store at The Dubai Mall to up your wrist game that will become your health and fitness partner while stepping up your style quotient. The HUAWEI TalkBand B5 is available at the HUAWEI Experience Store located at The Dubai Mall and across select retailers in the UAE at a price of AED 699 for Sports Black Silicon Strap version and AED 799 AED for Business Mocha Brown Leather Strap version. Service Offer in the UAE 12-month manufacturer warranty across Huawei Service centers.